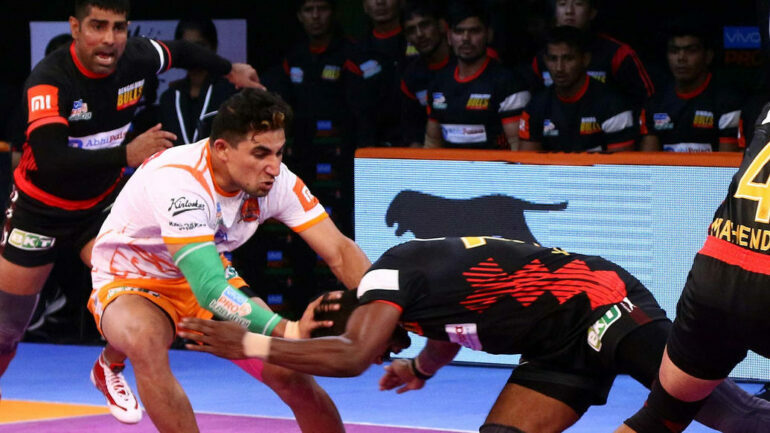 On the fourteenth day of Pro Kabaddi League season 6, the First match of the day was Dabang Delhi vs Bengal Warriors. Dabang Delhi played three-match one won, one Lost, one tie. Bengal Warriors won two matches and one tie. This is now inter-zonal matches between teams. Dabang Delhi won the toss and selected choice of court. Bengal’s Shrikant Tewthia with unsuccessful raid and a bonus point and at this moment with a 9-9 score on the table, Bengal Warriors all out after 14 minutes. At halftime, Dabang Delhi leads with 3 points against Bengal Warriors with score 16-13 on the table. After 15 minutes of halftime, Bengal Warriors again all out with score 25-15 on the table. Dabang Delhi managed to convert the three-point lead to nine-point winning score 39-30 on the table. Dabang Delhi won the second match of Pro Kabaddi League Season 6. Puneri Paltan is top on the table with four wins, two losses and one tie. Bengaluru Bulls with two wins in their two matches. Both teams are very well confident with two consecutive wins and as per performance in this season. Bengaluru Bulls won the toss and selected choice of court. Score 1-1, 5-5, 6-6, 7-7, 9-9, 10-10 as game progress gives an idea of how strong competitive performance and exciting match it was. At halftime, Bengaluru Bulls lead by three points with score 13-10 on the table. Again 16-16, 17-17, 19-19, 23-23, 25-25 score hold breath. Before 1 and half minute score on the table 25-25, this how exciting it to watch strong teams. Puneri Paltan again won the match with last-minute thriller with 2 point lead with score 27-25 on the table, this is the fifth win for Puneri Paltan.